In the beginning of the year, I partnered up with a friend, Amy Savoie, who is by trade a carpenter. (She is also a furniture designer, house flipper, mom, wife and artist… ) However, her main focus/job is carpentry work. Me like most women, find this fact fascinating… For one reason, I do not know a lot of female carpenters. The second reason, I wish I had these skills. So knowing a woman who is so engaging & loves art and home design as much as me, makes it easy to talk to, ask questions and learn from Amy. She gets told often “I wish I had learned those skills” from many women. So in effort to bring these skills to the many women out there, Amy approached me to help her with her passion project: Woodshop Girl. A website dedicated to teaching, inspiring & sharing the tips, tricks & helpful hints to build on your own. The website is a central place for all the knowledge and honestly, this project is a bit of a bohemouth. Often we are not sure which direction to point. We know ultimately, we want to offer classes & instruction but we are slowly working our way towards that goal. So for woodshop girl, I had developed the brand. 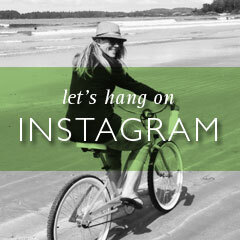 We created an inspiration board on Pinterest which I will admit I do with every client. I start off by creating a secret board where upon I select colour combos, images, fonts, pictures of the target market to help inspire what ultimately I will design. Sometimes I delete the board & sometimes I publish them. This is just a snapshot of a few of the pins I had saved but essentially what I had in my mind was a little bit of wood with a pinch of industrial design as the motif for ‘Woodshop Girl’. What was great about collaborating with Amy is that we were always on the same page. I would drum up some ideas and she often claimed I was reading her mind. I think that was partly due to the fact that I know her well. I didn’t have to research deeply about who the client was.. I just knew it. The Client: Female aged 30+, middle class income bracket, home owner, lover of beautiful design, obsessed with pinterest and most importantly a closet DIY’er. This is someone that wants & needs to be empowered to do the projects around the house or as I put it “I want to build what I see on Pinterest but just do not know where to start”. Basically, her client was me. Of course, there is a pinch of wanting the site to be attractive as well. If you glance at any of the furniture that Amy designs, you would see that her pieces lean towards the industrial look. It is clean design with reclaimed luxury materials. So.. what would the brand be? One thing I was attracted to was how there was a dichotomy in the board. There was brick with wood, metal with wood; hard & soft, light & dark. It really was about being tough with a soft edge. When I began brainstorming logo idea, I soon felt frustrated. I felt that I was over thinking the design. So what is Wooodshop Girl? Fundamentally, Woodshop Girl is just that.. wood but more importantly designing out of wood. I had brainstormed several ideas but none of them would land. So I managed to design a logo out of not just wood but a way to present it that is turned on its side. Not all the rings are present. I use the contrast of fonts to illustrate the contrast further. I always start my designs in black & white because a good logo should stand alone in 1 colour. So what I love about this logo is that the colours add to the design and are perfect for the esthetique. Stripping back the idea and examining what the brand was really about hit a note and I knew I was on to something in the next round of designs. Ultimately, I chose a logo that would fit into a square format as most social media platforms require a profile picture to be as such. The website is a constant work in progress… Currently I’m trying to figure out the best way to showcase the feature images (which I need to do sooner then later!). 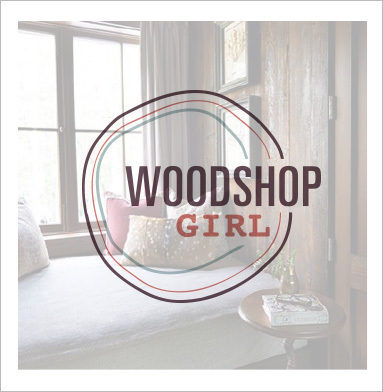 So I encourage you to mosey on over & check out Woodshop Girl. This is a constantly evolving brand so check back often to see what updates we have added. Maybe you will be learning something yourself!